The modern economy and civilization itself is predicated on trust. There is not enough policing and monitoring to insure against bad behaviour so we rely on brands to view good behaviour as an essential business practice. They must honour the trust consumers invest in them. And, polling certainly suggests that Canadians think trust is important. Considering the response to a number of questions on brands and trust asked by Ipsos for Readers Digest. The two questions with the most agreement are that Canadians trust a company that stands behind their products and that they choose a company they trust when price and quality are similiar. The first is a reflection of the fact that actions, through standing behind products, speak directly to trust (92% at least somewhat agree). 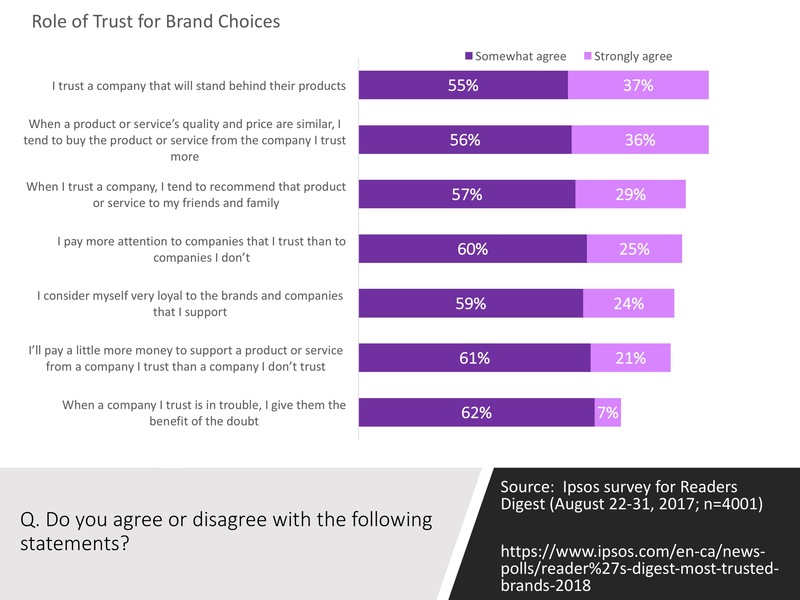 The second suggests that trust or in other words a relationship with the brand is decisive when other factors are controlled (92% at least somewhat agree). Note that trust provides only some insurance for companies that get into trouble. While 69% at least somewhat agree, only 7% feel strongly that their trust moderates their response to a company that gets into trouble. Bad behaviour is likely to be punished. Across the other indicators more than 8 in ten hold positive views about brands they trust. This is a reflection of the fact that products and services that we purchase are more than simply transactions, at least when presented in the abstract like they are here. Purchases are about the relationship with a brand and the emotional aspects of purchase decisions. Canadians recommend products or services, pay more attention to brands they trust, consider themselves loyal to trusted brands and are willing to pay more from a company they trust compared with one they don’t. Of course, only 21% feel strongly about paying more which suggests that their are limits to the power of trust. Interestingly, women and higher income Canadians tend to be willing to pay more for products or services from brands they trust and to recommend brands they trust. 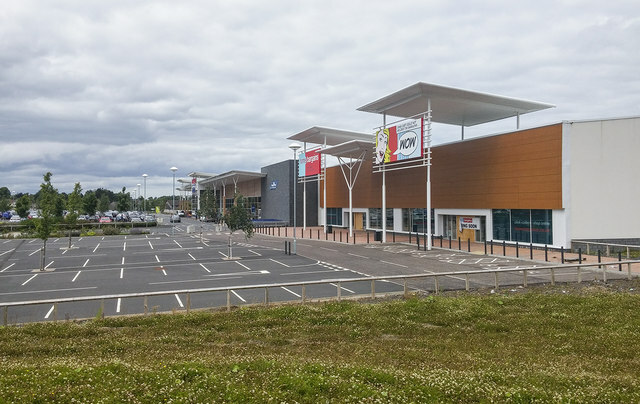 The value that consumers place on trust is clearly evident and the bread price-fixing allegations that retailers and suppliers colluded to keep prices high over more than 15 years has the potential to undermine the trust consumers have in brands. Trusted brands should be very conscious of this given they appear to benefit significantly from their trusted status. For a list of the top 30 trusted brands in Canada by category visit the Reader’s Digest site. The list includes many brands that have maintained their privileged position for more than 5 years (TD Canada Trust (6 years); Tim Hortons (5 years); Sun Life Financial (8 years); Tylenol (5 years); Toyota (7 years); Shoppers Drug Mart (5 years); Coppertone (8 years); and Jamieson (7 years)). It will be interesting to see if the high profile reaction to the minimum wage hike undermines Tim’s Hortons’ position next year. Source: Ipsos conducted the research between August 22nd and August 31st, 2017 for Reader’s Digest Canada. A sample of 4,001 Canadians aged 18+ were interviewed. The Ipsos information is available here.